Is there a way or NRQL to add deployment events within Insights custom dashboard? Then no, it is not currently possible to display that in Insights. You may, however, use Insights’ event API to record a custom event with information about deployments, and display a list of those events on a dashboard. ntly possible to display that in Insights. You may, however, use Insights’ event API to record a custom event with information about deployments, and display a list of those events on a dashboard. 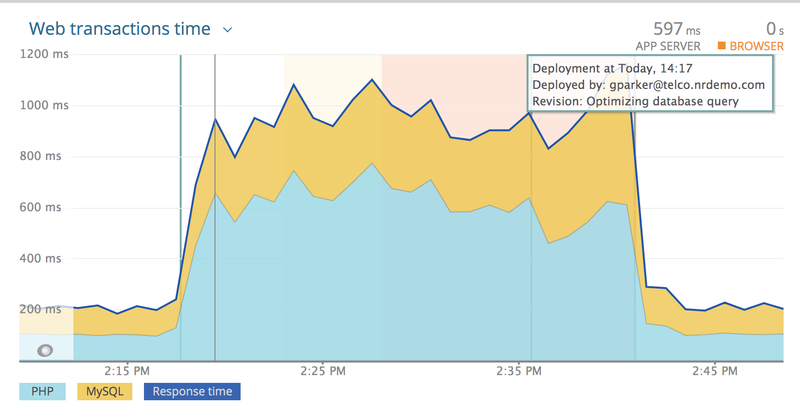 Yes, you can display the deployment dates and times in Insights, if you send a custom event. It will be more challenging to show the other metrics (Apdex, Response time, etc.) in Insights: You will have to figure out the timestamp of the previous deployment, and calculate the metrics between the two deployments. There is a feature request for this functionality @cinni.kalsi. Pop over and add your vote. @cinni.kalsi Please do go ahead and vote on the poll – more votes helps the right folks prioritise these requests.